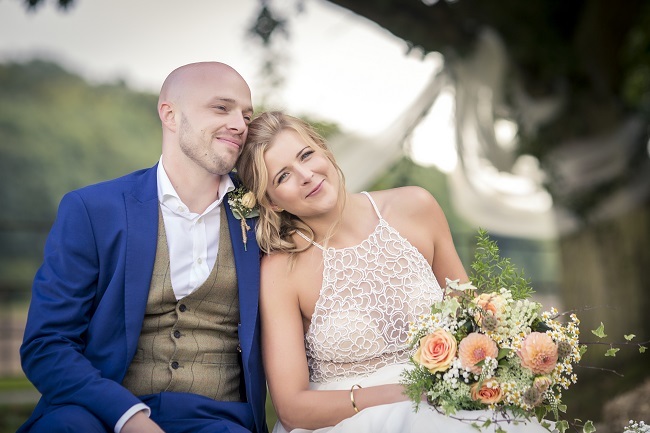 You might think that a boho wedding sounds simple? I think Frin, the bride’s mum, might disagree! 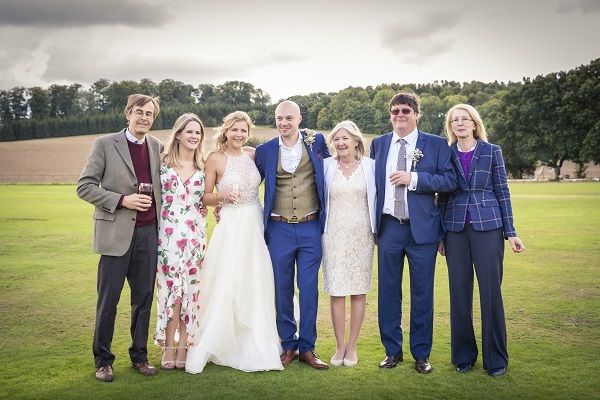 An enormous amount of work went into Fiona and Giles’ wedding at Amersham Cricket Club. 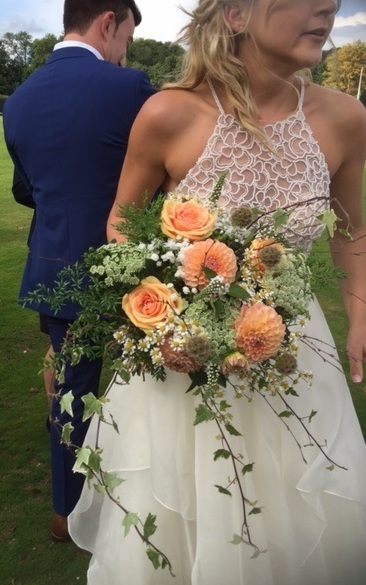 We made Fiona’s rustic boho bouquet from peach dahlias, ammi majus, tanecetum, scabious heads, ivy, ferns and gypsophila with a sprinkling of birch twigs. 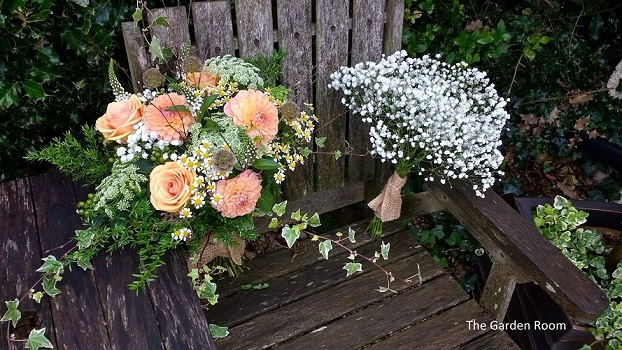 Her sister’s bouquet was of gypsophila, and both were tied with hessian ribbon. Not really boho but definitely festival! Fiona arrived by helicopter – a complete surprise! Afterwards, the guests then walked towards the trees to take their places for the ceremony. Dark clouds had built up in the sky so we had our flower arch at the ready, in case the ceremony needed to be moved to the club house. 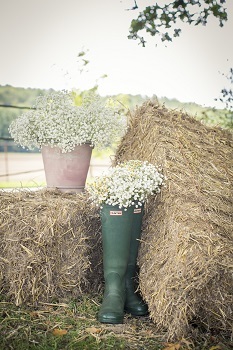 It’s always worthwhile having a wet-weather alternative for outdoor weddings. 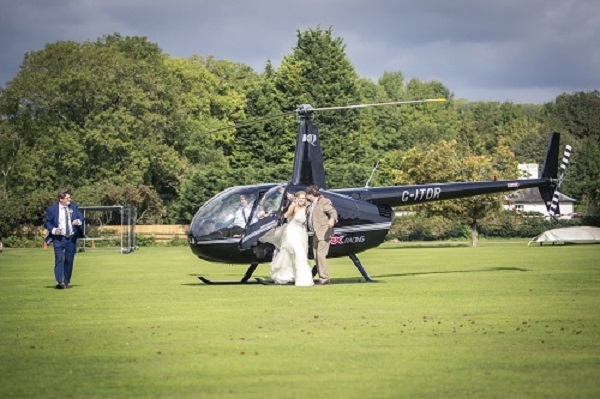 Had it been needed, it would have provided a nice “frame” for the couple as they said their vows. 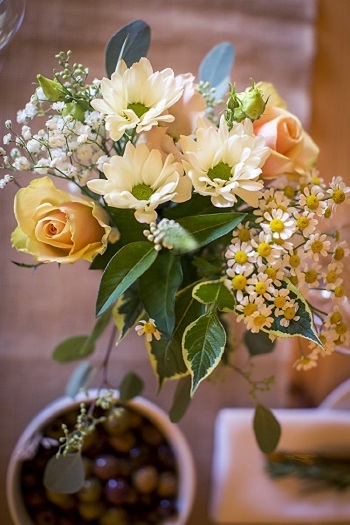 All morning, Fiona’s team of boys worked on getting everything in place for the reception and ceremony. 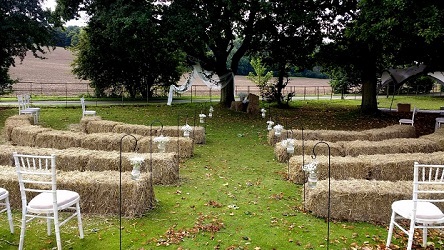 All those gym sessions definitely paid off boys – there was no way I could have lifted one of those straw bales myself! Meanwhile, we were busy draping the trees with organza and ivy to create a wildly romantic setting for the marriage. 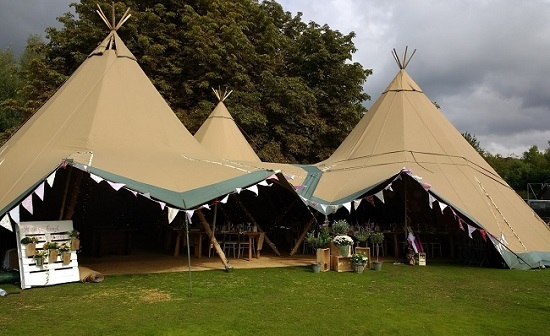 After dressing the ceremony, we got started on dressing the reception tables under the teepees. 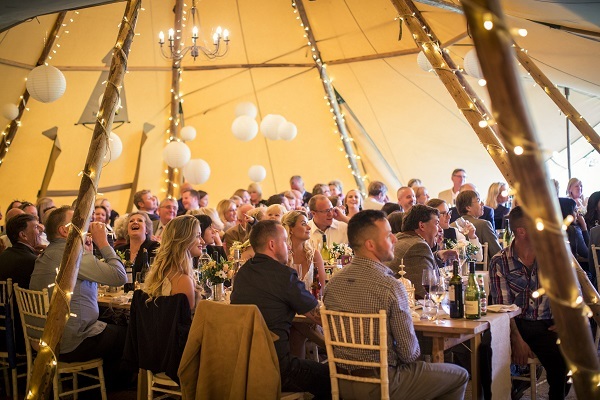 I loved the seating plan below – not sure who to credit for that one but it was definitely homemade and something worth copying! 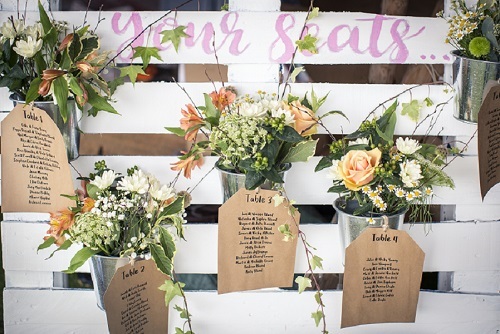 It was very effective with metal pails of flowers and luggage labels attached showing the table numbers and guest names. 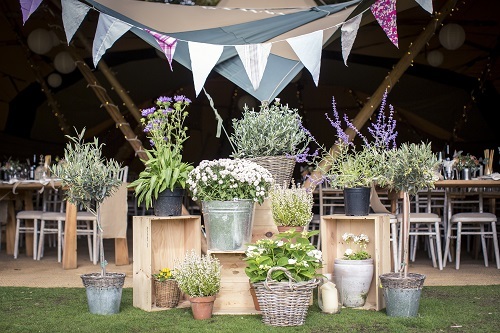 The bunting, wooden wine boxes and planters completed the setting for the reception. 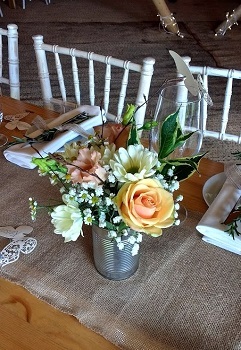 They also used tin cans full of wild flowers and lanterns on the guest tables. Well done Frin and family for eating your way through tons of beans and soup in the months before the wedding! 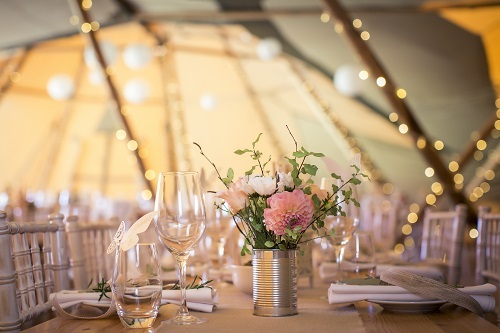 If you want to change the look of the cans or pails for your own boho wedding, they look really interesting sprayed in copper or gold paint. Simple, yet effective! 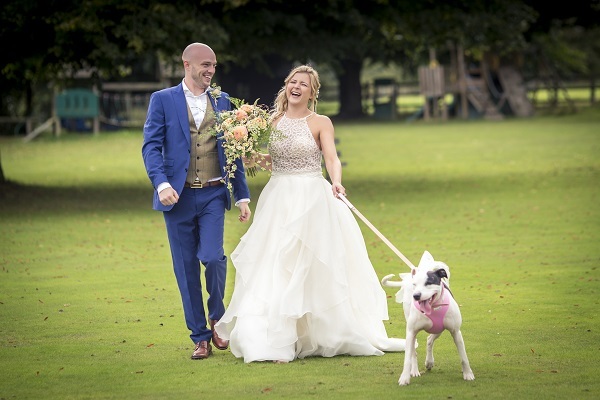 Fiona’s “baby” Tinks had to be a part of the big day too! 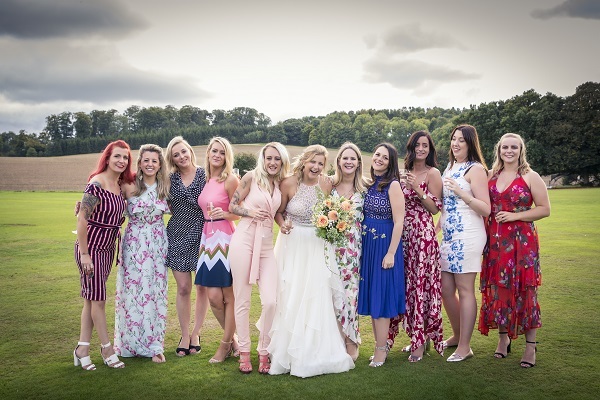 The bride, guests and family looked relaxed and happy after the ceremony. 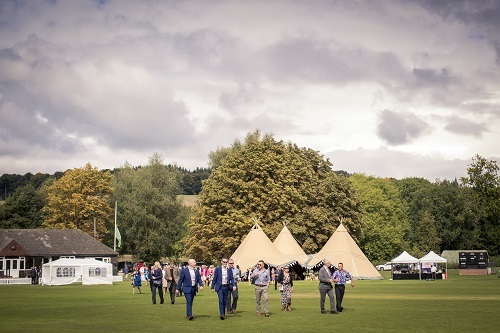 After the ceremony, big celebrations followed in the teepees. 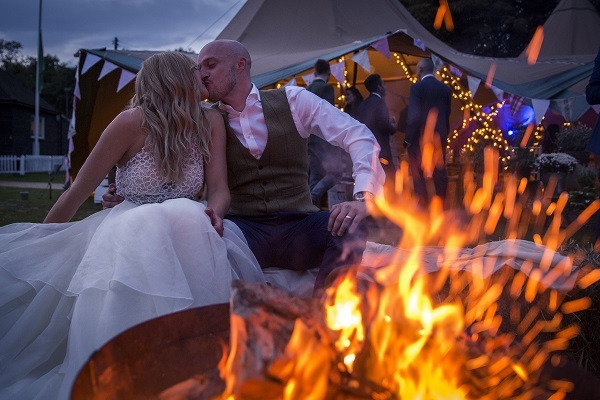 Although it was quite cold, I reckon there was plenty of body heat to keep the venue warm! Nearly forgot to mention the cake! 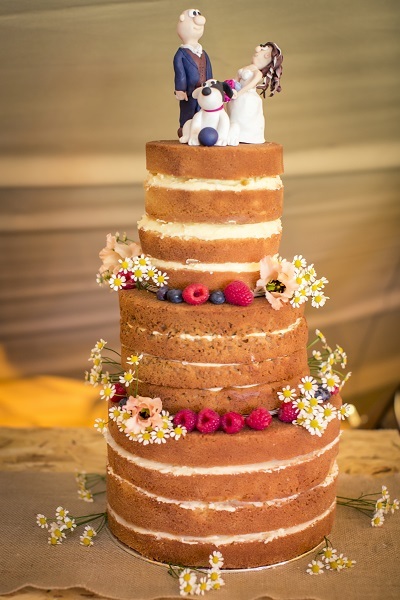 It was a naked sponge hand baked by sister Pippa with a few daisies and raspberries for simple decoration. It was even graced by models of Giles, Fiona and Tinks on top! Thanks to Shell Sperling Photography for some of the amazing images above.